Max Streicher (Toronto, ON), Dung Beetle, 2005, recycled billboard vinyl, electric fans, 9.2 x 6.4 x 6.1 m., Kitchener City Hall Rotunda. Photo: Gordon Hatt. 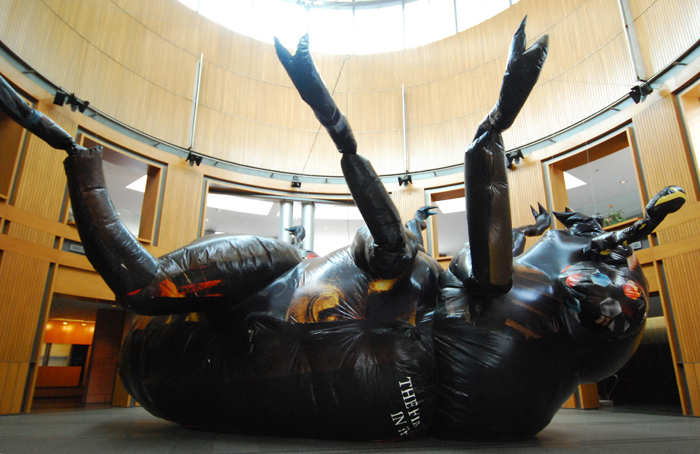 Dung Beetle is a 30-foot-long inflated sculpture of a dung beetle on its back, constructed of recycled billboard vinyl. Hieroglyphs of advertising slogans are etched across the glossy vinyl, which Streicher chose specifically for its insect-like sheen and tactile qualities. Known for his inflatable installations and kinetic sculptures, Streicher contrasts the heady and buoyant messages usually conveyed by inflatables with existentialist references to Franz Kafka's Metamorphosis. Max Streicher is a Toronto-based installation artist who since 1991 has worked extensively with kinetic inflatable forms, exhibiting his work across Canada and abroad in numerous public, commercial and artist-run galleries. He has completed several site-related projects, most recently in Venice, Siena, Stockholm and Erfurt, Germany. Streicher was a founding member of the Nethermind collective of artists, which organized four large exhibitions in alternative spaces in Toronto between 1991 and 1995. Recent exhibitions include Blow at Felix Ringel Galerie, Düsseldorf, Germany (2007), and Quadriga at Centro Cultural de Belém, Lisbon and Luminato, Toronto (2007). Streicher is no stranger to the Waterloo Region having exhibited his work at Cambridge Galleries (Sleeping Giants, 1998) and Four Horses at the Kitchener Waterloo Art Gallery (2003).